After 109 years, NAR enjoys an established thought leadership position within its industry. NAR has a good communication strategy in place, but to stay ahead of competitors and continuously grow its audience, the team must constantly re-evaluate its approach and keep up with the latest trends and best practices. “We have very useful and engaging content, but we want it to reach more people. We realized we needed to organize and present that information in a more digestible fashion,” said Sara Wiskerchen, Managing Director, Media Communications, National Association of REALTORS®. NAR turned to a team of experts at PR Newswire (a Cision Company), who offered them a consultation session to discuss recent media trends and how content can be optimized to better meet the needs of today’s media. “We send about 125 press releases annually via PR Newswire’s distribution network,” said Wiskerchen. “We see good results but know that they can always be improved. Given the high volume of releases we send, ROI is important. It is imperative for us to understand today’s state of the media so that we can better optimize our content and make sure we meet the needs of our audience.” The consultation uncovered areas of improvement and offered actionable advice. Increase in visual assets: In the past, NAR included their logo and a headshot of quoted experts. 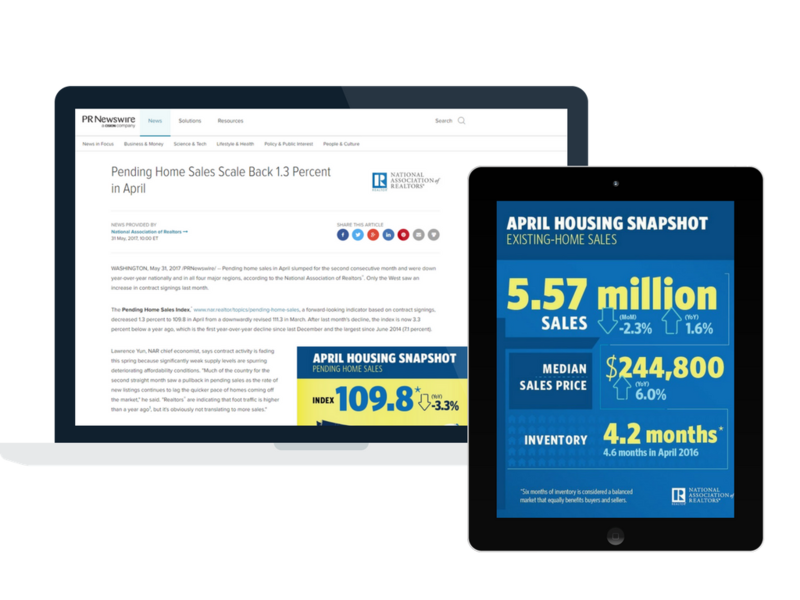 PR Newswire advised NAR to shift its strategy to integrate more infographics, charts and visuals that complement the story – helping readers to digest the main news points quickly while also encouraging sharing. “The infographics really help our audiences digest the information and visually summarize the news releases. For example, pulling out the five takeaways from a 40-page report,” said Wiskerchen. Monthly content spotlight: As NAR sends out content quite frequently, one last tip given to them was to send out a release at the end of each month highlighting top content from its consumer facing website, HouseLogic.com. Their audience can find all pertinent information in one place and redirect traffic to past, existing content to give it repeat exposure.